It seems 2016 has taken another legend from us. The Associate Press announced this morning that comedic actor Gene Wilder passed away this morning at the age of 83. The actor, best known for his roles in Blazing Saddles and Willy Wonka and the Chocolate Factory, was a two-time Oscar nominee. Though he has not been in the spotlight for almost a decade his influence can be felt all throughout modern comedy. Able to float freely between drama and comedy Wilder could touch your heart and make you spit out your drink in laughter in the span of minutes on screen. 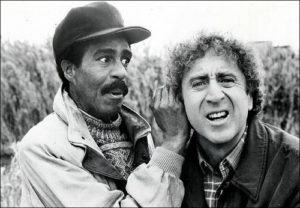 Richard Pryor and Gene Wilder would become one of the great comedic teams in four movies together. Born in Milwaukee, WI he first got his start in theater in the off-Broadway production of “Roots” in 1961. His big break came in 1963 when fellow cast mate Anne Bancroft, who was working with him in “Mother Courage and Her Children” introduced him to Mel Brooks. The two hit it off instantly and went on to create comedy classics like Young Frankenstein and The Producers together. Over the course of his career he would go on to direct and write a number of films throughout the 70s and 80s. Wilder retired from acting 2003 though he made a surprise appearance on the kids show Yo Gabba Gabba! in 2015.